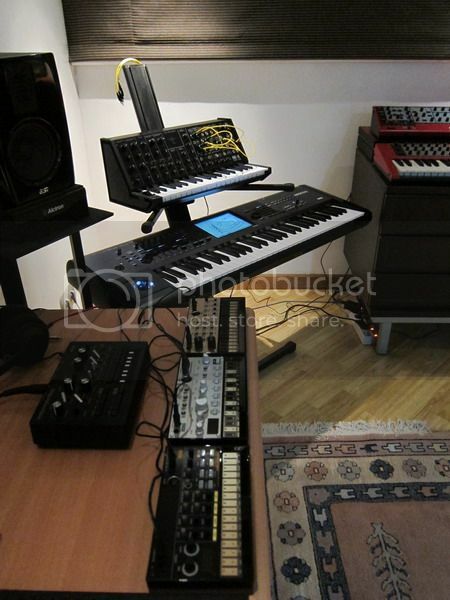 I want a keyboard stand with at least two tiers for my Yamaha SY77 and Korg DSS-1. As they weigh roughly 40 pounds each, this would need to be a very sturdy stand. I also have a Yamaha DJX (much lighter) and am considering buying a smaller, virtual-analog synth. I have a lightweight stand that I could use for the DJX. Does anyone have recommendations for a mini keyboard stand that could maybe attach to a larger one? I'm new to this so have many questions. Thank you. I'm using the old Delta series from Ultimate for more than 25 years and it's still standing. A bit sign of aging, made it not as balanced as before, but still can hold a Kronos and MS-20m nicely. It's being replaced with the newer Apex series, which hopefully won't disappoint it's predecessor. The load capacity is 125 lbs. per tier or 250 lbs. total. The lighter IQ-1200 is way cheaper, could be a good one for the other smaller keyboards. Last edited by crystalmsc on Thu May 18, 2017 3:39 am, edited 1 time in total. crystalmsc wrote: I'm using the old Delta series from Ultimate for more than 25 years and it's still standing. A bit sign of aging, made it not as balanced as before, but still can hold a Kronos and MS-20m nicely. It's being replaced with the newer Apex series, which hopefully won't disappoint it's predecessor. The load capacity is 125 lbs. per tier or 250 lbs. total. The lighter IQ-1200 is way cheaper, could a good one for the other smaller keyboards. Thank you. These are cheaper than the triple-tier I've been looking at. I do have a question, though: are the tiers width-adjustable? Not on mine, but if you put it closer to the back, it would hold smaller stuffs.